4 pack of vented funnels to handle any home, garage, or farm job, (two 10″, two 12″). Use the 12″ funnel when moving large amounts of heavy fluids and the smaller 10″ funnel for automotive use or tighter spaces. If you’ve ever tried to pour a large amount of oil through a funnel you may have made a mess. As the oil pushes down, an air bubble forms, and when it moves to the top of the funnel you have a messy overflow. I know this because the last video I did on doing an oil change I forgot about the “bubble factor” and dumped about a 1/2 quart of oil all over the top of my tractor engine. I did my best to clean it up, but all summer long, every time I ran my tractor for an extended period of time, there would be a little more oil find it’s way to the exhaust manifold and I’d get to smell the sweet aroma of burning 10w40! That won’t happen with the SpeedyFLO Funnel. It’s patented design features a molded-in air straw that eliminates the bubble and allows the oil to flow like water, making oil changes quick and clean. 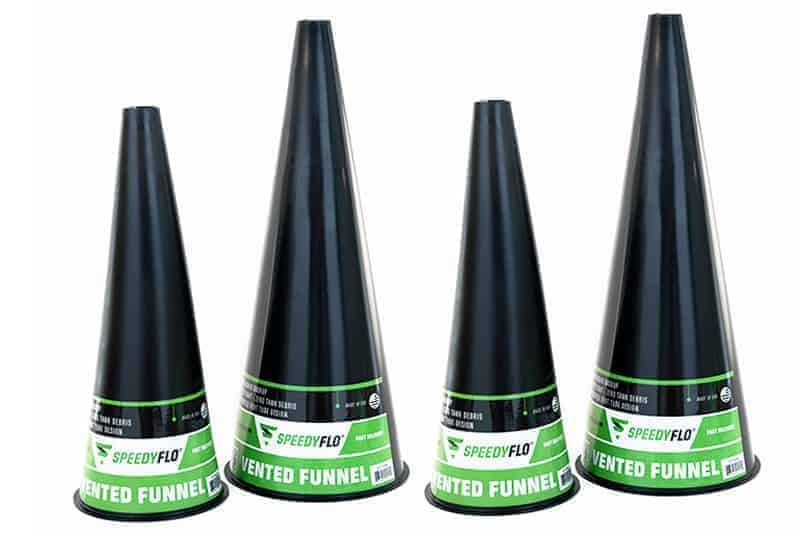 The SpeedyFLO Funnel greatly speeds up the process of changing oil and works especially well if you purchase bulk oil in larger containers. SpeedyFLO is only available in packages of four, because shipping lesser quantities means you pay about as much for the freight as you do for the product, and that just doesn’t make sense. If you don’t need four funnels, leave two in the box and give it to your favorite D-I-Y’er for Christmas or to dad for Father’s Day. Anyone who does their own oil changes will appreciate what SpeedyFLO can do to make the job easier!